Ecwid was released 3 years ago on September 25, 2009. Since the very beginning we have been working hard to create a shopping cart that changes the way people create and use online shops. A shopping cart, unique by all means, easily embedded to any existing website, blog or a Facebook page. A solution, just as easy as adding a YouTube video to your blog post. These 3 years were exciting for us. — We already have 200,000+ registered merchants. It took two years and three months to get the first 100,000 users and it took only 9 months to get the other 100,000. We’re growing fast. — Ecwid is used in 174 countries. Its storefront is translated into 43 languages. It means about 4.3 billion people can see your store in their native language. — Our users created about 15.4 million products and uploaded 50.7 million of product images. — Ecwid servers processed more than 7.3 billon requests. — 61,952 posts created on our forums. About 35% of all posts are from Ecwid team. Ecwid grows rapidly and we’re not going to stop. We’d like to give a big Thank You to all our community. You’re great. Your help, support, suggestions, feedback, criticism, comments and kind words have been invaluable to Ecwid’s development and achievements. Thank you. 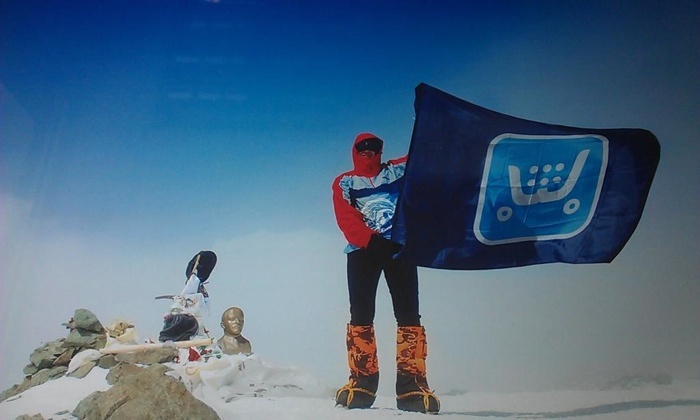 Ecwid flag at 7,100 m (23,406 ft) — at Lenin Peak.